Oversized drinking glasses are well-known to collectors. Made in many countries, from as early as the sixteenth century, most were probably designed for special occasions or as show pieces to demonstrate the skills of the craftsmen. Is the item shown here one of these, or is it a compote? If the item in question is a drinking glass it would be suitable for the Jolly Green Giant. It dwarfs two standard-size glasses. On the left is a L. Straus & Sons champagne cut in the Unique pattern on shape no. 170 with a height of 4.75″ (12.0 cm). It sold for $75 in 1988. The wine glass on the right is cut in a “starred block” pattern, manufacturer unknown. Its foot is cut with an 8-pt star that is flashed with 5-ribbed fans, and it has a height of 5″ (12.7 cm). It is from a set of four matching glasses that sold for $140 in 1991. 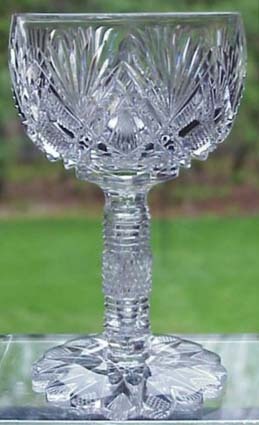 Although the originator of this pattern has not been positively identified, identical stemware was seen by the writer several years ago at the New Bedford (MA) Glass Museum (now defunct). He was told that the examples there were made by the Mount Washington Glass Company, but the museum could provide no documentation. The item in question was definitely made by C. Dorflinger & Sons. The pattern, called Brilliant, is shown in the book DORFLINGER, by John Quentin Feller, where both line drawings of it (p. 240) and an actual celery tray cut in this pattern (p. 33) are shown. The shape, however, can not be found in this book, nor is it shown in the DORFLINGER LINE DRAWINGS compilation. This latter collection does, however, show tall compotes with similar proportions, although their bowls are shallower. Fortunately, Feller provides a photograph (p. 93), taken about 1905, of the sorting room at the White Mills factory. Four of these items are shown on the draining board over the sink where they have been washed prior to packing and shipping. The pattern is indistinctly shown, but the shape and size are unmistakable. The drinking glass/compote is 11.5″ (29.2 cm) tall and has a 6.25″ (15.9 cm) diameter rim. It holds a full pint of liquid comfortably and up to 28 oz. if filled to the rim which is thin and posibly was designed for drinking. The bowl increases in thickness away from this rim and is deeply cut. While the thinness of the foot is more typical of a goblet than a compote, several compotes in the line drawings have this characteristic. These features, together with the large teardrop in the stem, which is panelled and finely notched, result in a weight that is lighter than expected (about 2.75 lb), but this is increased by a pound when the goblet contains a pint of liquid refreshment. The item’s glass metal has the familiar Dorflinger brilliance, and the polish on the cut surfaces is excellent. 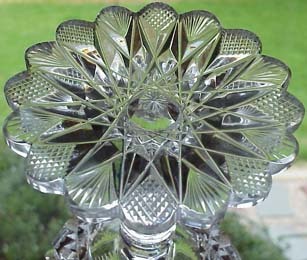 The pattern is of the double-X vesica type, a “sampler” that contains seven individual motifs: fan, flashed blaze, hobnail, Brunswick star, hobstar, single star, and strawberry (fine) diamonds. The foot is cut with a 24-pt hobstar that has a single star on its hobnail. Whether this item is a drinking glass or a compote — and it probably is the latter — it should be regarded as a scarcity (although we might find a couple of them on eBay any day now!). It sold for $300 in 1988. 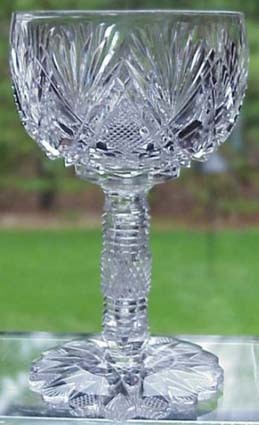 Many collectors are introduced to the Parisian pattern by an illustration in Revi’s book (1965, p. 281) where a water goblet “with [an] unusual mitered stem” is shown. 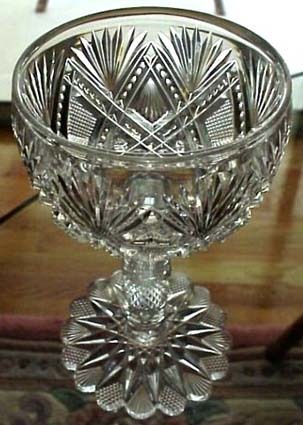 Seven years later it, or its twin, appeared in Kathryn Hait Dorflinger Manchee’s account of the manufacturer with the claim that “This particular goblet, with its intricately cut foot, was never put on the market.” (note 1). The fact that it has yet to appear in one of the company’s extant catalogs would seem to confirm Manchee’s contention. But, as the years have passed, this particular pattern/shape combination has appeared in the marketplace, where it is considered rare. We now know a bit more about it. The goblet’s shape is no. 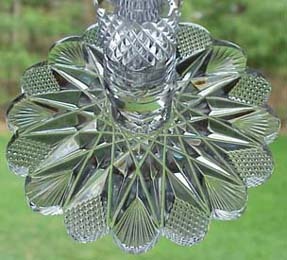 80, more familiar to collectors as the stemware blank used for Dorflinger’s Spiral pattern. 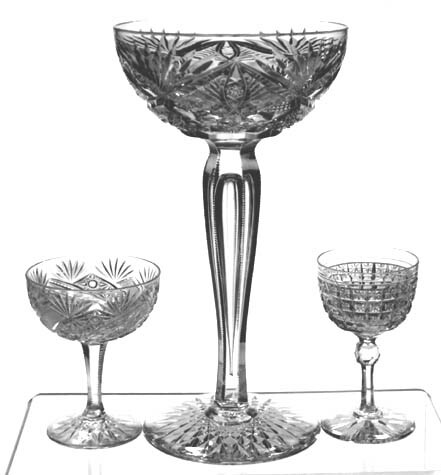 Consequently, five or six different types of stemware are likely to have been made in the Parisian/80 combination. In addition, because this combination was probably made about 1890, it would not be surprising to find examples of wines produced on color-cut-to-clear blanks. And this is just the happy circumstance that occurred in the spring of 1983, when the writer came across a set of four Parisian/80 red-cut-to-clear wines in a general-line antiques shop on the Connecticut shore. Since then he has seen a fifth c-t-c wine (with a damaged rim) in the Catskills. Although probably not cut in abundance, certainly, this combination was not necessarily produced as a “special order” item either. Unfortunately, the writer disposed of his four wines before he could obtain a good photograph (note 2). But luckily we now have the set of images, below, of a colorless wine that duplicates the colored wines in all particulars except color, courtesy of the Internet. The glass shown here has a height of 4.9″ (12.4 cm) and a rim diameter of 2.9″ (7.4 cm). The stem is blown with an air trap that extends through most of its length. The four c-t-c wines also had this air trap, and they weighed about one-half a pound each. They sold individually during 1983 and 1986 at prices that included: $140 (repaired rim), $250 (with a thin, uneven overlay, a fault that is sometimes found on Dorflinger cased glassware), $300, and $375. (The wines were purchased for $20 each.) The colorless wine shown here sold at auction for $700 in May 2002 (Images: Internet). 1. Manchee, K. H. D., 1972: Dorflinger glass, part II, The Magazine Antiques, June, pp. 1006-1011. 2. A fair-quality photograph, possibly of one of the original four wines, is shown in The Hobstar, Special Edition No. 1, p. 12 (Feb 1995).